Our featured insect can be quite difficult to spot on a plant. Do you see the insect? I'll give you a hint: The head is covered. You can see why it is called a tortoise beetle. In fact, it is the thistle tortoise beetle, Cassida rubiginosa. 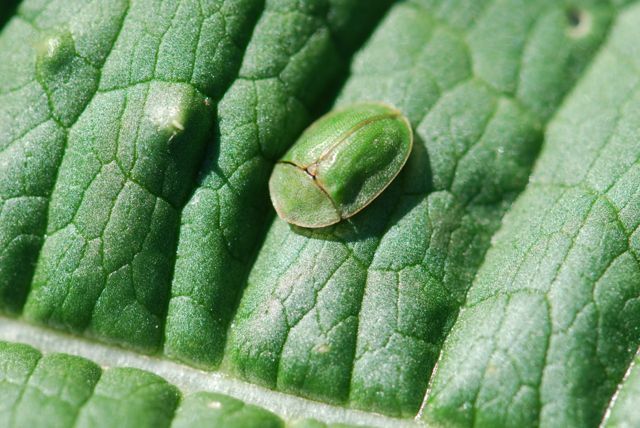 The thistle tortoise beetle has an interesting history. It was introduced into North America because it feeds on a weed that was accidentally introduced earlier, the "Canada" thistle. By the way, the "Canada" thistle is actually from Europe, where it is called the creeping thistle. Shows you how misleading common names can be! 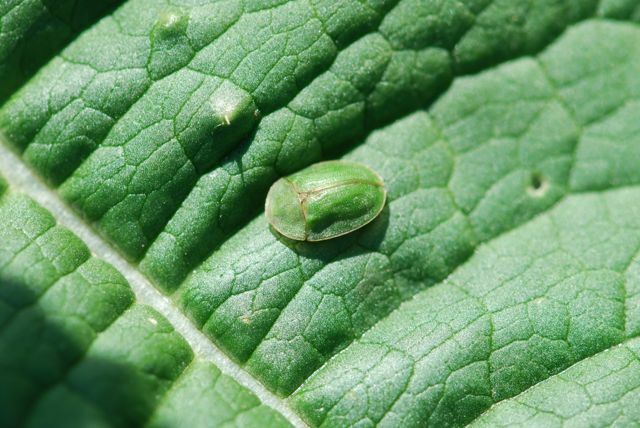 In any case, the thistle tortoise beetle is an insect that was purposely brought in for weed control. The larvae of this species (see BugGuide) carry debris and feces on their backs to discourage predators. Wish I had found one of those. These photographs were taken in western New York. Have you ever seen a tortoise beetle? Was it green like this one?